"In the mid-90s dub was a big thing in Berlin, not in comparison with the techno scene of course, but there were regular dub events in lots and lots of venues. Towards the end of this movement, at the end of the 90s and early 00s, the psychedelic trance scene gathered at RAW.tempel. At this time psychedelic trance and dub were quite closely related, because dub was nice for the chill out area, along with the chai shops and everything. That was the first connection between RAW.tempel and dub. The psychedelic trance scene then moved away but the dub scene stayed, and it's really established itself there. - So what kind of dub are we talking about here? When we're talking about the mid-90s, most of the dub played here was UK style: Adrian Sherwood’s On-U sound, African Headcharge, Dub Syndicate, Audio Active, along with Dreadzone, Rockers Hi Fi, the Disciples, Zion Train and the Universal Egg crew - this is what I mean when I say UK sound. They were much more present than Jamaican dub, which had been ruling the scene for the previous 20 years but was not really recognized in Berlin. There was a time for reggae, the late 70s and early 80s, it was really big, but that was Bob Marley, Jimmy Cliff, and there wasn't so much talk about King Tubby, Lee Perry, Sly and Robbie or King Jammy. Then the techno thing started, and it influenced dub production. So with new technology and fresh ideas from electronic music they formed this 90s electronic dub, which was mainly done in Britain. So the dub and reggae idea came up again but in a new 'coat', let's say. And this second generation of dub got quite popular in Berlin and some other German cities. A guy called Deeroy [proprieter of the celebrated Deeroy’s Dub Store on Pappelallee, now closed] organized the Dub Cruiser, and together with a guy called Lujah he opened the legendary Dub Club. Then the scene died down again, at the end of the 90s, and now it's coming up again mainly in the form of dubstep and dubtech. It gets fresh ideas again, it's kind of the third wave of dubby ideas. - Do you find that the same people who listen to 90s dub listen to dubstep? Yes, it goes quite well together. If you see what's going on in RAW.tempel, there's the Dub Wohnzimmer every week on Wednesdays, and for years they've been doing nothing other than UK dub, sound system dub, with some Jamaican roots, and now they're also heavily involved in dubstep. But many organizers or places where they do dubstep also come from the drum'n'bass side. It doesn't really matter which side you're discovering it from. What I'm expecting and hoping and really like is the idea that people are discovering dub because they have discovered dubstep. - You said to me a while ago that you were really interested in European dub rather than UK dub right now. It's a personal thing of mine, in the 90s I was listening to so much UK dub, I know it for some fifteen years already, and I’m always hunting after fresh ideas. And what I've found is that there's a large, growing scene in Europe, especially France, which has a completely different cultural input into their dub community, because they're not so related to the English speaking part of the world and they have a lot of immigrants from North Africa and Arabian countries. They often have a combination of a lot of different musical influences, so it's sometimes really hard to explain to anyone why I would call it dub, because if you're not into the subject you don't hear that there's a dub idea inside. So French dub has this drum’n’bass aspect, Arabian sounds, rai, hip hop, breakbeat, a nice unique mixture of different styles, open to a lot of things. This is what I really like, this is vital. - Can you give us some idea of who you’re thinking about here, which artists? Kaly Live Dub, Le Peuple De l'Herbe, Zenzile – though they’ve seemed to shift away from dub now. And above all Hi Tone and Brain Damage from the Jarring Effects label. It’s one of the most creative labels I know, where genre borders don't exist, a very fusion-orientated label. They get musicians from a lot of styles, a lot of countries, a lot of musical backgrounds, put them together and form new projects, but the dub idea is still linking everything or nearly everything. 60-70% of the output of that label is related to dub in any case. Led Piperz is a fantastic dubstep project also from France, and you have Fedayi Pacha. Led Piperz performed at the Jarring Effects night in Maria and I wanted to go home because it was early in the morning and I was kind of through with the day, but Vincent, the label manager, forced me to stay to see them: 'They do some dubstep, but it's not only dubstep ... if you've seen Benga and Skream already, forget about them, it's much better...' Well, I'd seen Benga and Skream at the beginning of the year at Club Transmediale, and was really impressed by their performance, so if someone's telling me that there's a dubstep project which is even more powerful than Benga and Skream I won’t miss it. So I stayed. And I really did not regret it. It was absolutely amazing! Dubstep is really popular now and it's really pushing things in an interesting new direction. But there’s also the releases from the netlabel scene, the combination between electronic music and dub. All the techdub and dubtech, which is becoming more and more popular, I think it's a child of this netaudio idea, because I never heard something like this before and I discovered a lot of stuff on small labels who are releasing mp3s for free. There's a lot of labels in Europe now specializing in techdub, which also gives the development of dub a fresh and interesting direction. - Again, give us a few representative names. Ok, Deepindub, an Italian netlabel run by a guy called Maurizio Micelli. Qunabu, a Polish label run by Piotr Kaliński. Then we have the German spearhead Jahtari, for chip-tunes reggae, 8 bit dub. Disrupt, Jan Gleichmar, who is the founder of the label, has really done a lot of good networking, he's come around, spread the idea and people really like his kind of music. The label also promotes this Bo Marley thing, a Danish performance group with mobile soundsystem and some freaks in incredible outfits. The singer speaks German and the rest of the band take it as funny voice samples. So this is a funny dub project who don't take things too seriously, they sing about meat, for example, an anti-vegetarian song, but with a twinkle in the eye. When you follow the words, the beginning of the sentence is different to what they're telling you at the end, they mix things up, make mistakes, do illogical things. There’s some quite Dadaistic aspects in their music and performances. I like this because they play with everything, they make music which makes you smile. And Marko Fürstenberg, for example, from Leipzig, the same town as Jahtari, he's done a lot of excellent releases in the past years. Volphoniq from France is a big name in the netlabel community, great performers, and also in France there’s Fresh Poulp Records. In Germany Stadtgrün from Cologne have put out a lot of decent techdub. And then there’s Ornaments, a vinyl label who are re-releasing some netlabel dubs or new stuff from netlabel dub artists. - When you say techdub, do you mean stuff influenced by Rhythm and Sound, Basic Channel, stuff like that? Yes, but it goes further than that, it's much more related to the minimal techno sound. Techdub or dubtech, you can have hard techno beats with a dubby tune running through it, so you have this relaxed atmosphere inside a really hard beat. Also you can have a dub tune which is so minimal that it is really reduced to the very basic elements, so you can hardly call it dub any more. It's not this loungey deep house dub thing, it's really a dancefloor filler. - Is it particularly a Berlin-associated phenomenon or not really? It's a niche, it's not a big wave rolling through the streets which everyone's excited about, but there's a small community who really like it. So for example last weekend there was the Thinner label night in the Arena Club, and they had an exclusively techdub lineup: Das Kraftfuttermischwerk from Potsdam, Marko Fürstenberg, Gabriel Le Mar who was a big name at the end of the 90s in the psychedelic trance scene. The night was completely done by techdub artists. These kind of events don't happen very often. But three years ago no one would have been attending. So they're creating something which is strong and getting stronger hopefully. - Back to RAW.tempel: it seems the RAW.tempel is more directed towards dub, while Yaam is more reggae and dancehall. Is this a deliberate policy? No, it developed a bit like this but Yaam is now doing more dub things also. The dub festival [3-5 Sept. 2009] will take place at Yaam. There's a small amount of people who organize these kind of events, and a small amount of venues where you can organize them: Yaam is bigger than RAW.tempel, you can fit more people in, you have the possibility to do a second floor, outside things even, so it's much more suitable for festivals. I'll probably go as a visitor, it’s relaxing to enjoy two or three days of heavy dub music without any pressure. So really I'm fine with this. 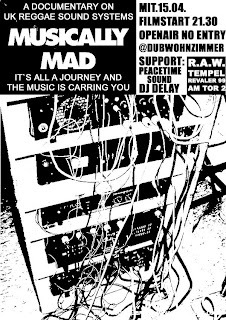 On the other hand, RAW.tempel was really supporting dub in the darkest days, at the beginning of this decade, when no one was playing any dub at all, and dub was a lost idea from somewhere in the past. Dancehall grew stronger and all the venues jumped on the dancehall idea. But we did dub, dub, dub, and no dancehall, and only a little reggae. And now with the growth of dubstep and the return of dub into the clubs, techdub, we're benefiting from the fact that we've been doing dub for all these years without looking at whether anyone else is doing it, or if we are cool or hip. There was a small dub community who were able to do their thing, and now this small dub community has become a bigger dub community. We do concerts, we have the weekly Dub Wohnzimmer, a lot of people are involved and some of them also do the Dubstation at the Fusion Festival. We've also started doing dubstep events with a series called Interzone. Not at RAW.tempel, but as a kind of spin-off, there was an attempt to relaunch the Dub Club, in the spirit of the original venue from the 90s. Eventually this didn’t happen but some other projects appeared like the Dub Pub, which is done by a lot of people also involved in RAW.tempel. 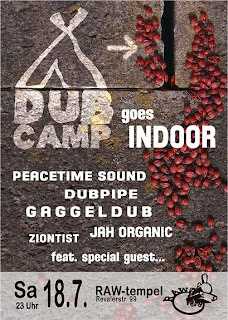 Then there's the Dub Camp at Rieben in June, a festival outside Berlin, which is also a spin-off of all the city's dub activities. And there’s dub in summer beer gardens and illegal open-air things in parks. So it's a good time to enjoy dub in Berlin these days. 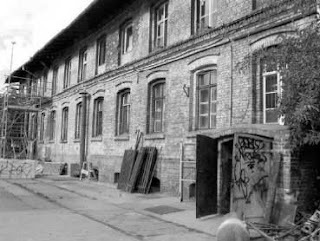 - It seems that this is a time of a lot of change for Berlin, in terms of structures, venues, gentrification, the Mediaspree project ... is RAW.tempel affected by these currents? On the one hand I have to disagree: the situation since the teardown of the Wall has been constant change, this city is always changing. There were massive changes in the 90s, when Berlin became capital of the reunited Germany, when they started to heal the wounds of the partition. So I wouldn't say that this is a time of specific change, it's been the same before: venues opening for a few months, closing, opening again on a different site, a new name, illegal, semi legal, vanishing again ... Berlin's been like this for 20 years. But on the other hand you're right. Development in the inner city districts, like Prenzlauer Berg and Mitte, was the topic of the first 10-15 years after reunification, but now change is more or less over in these areas because they're settled in a certain way. But the things you were mentioning, Mediaspree, this is the third and maybe last big field of inner city empty space where you can really form attractive places, whatever attractive means, and whoever you want to attract ... Mediaspree is a huge area, with major pressure from money, investors, big companies, global players. Of course RAW.tempel is affected by this, though not so heavily as all the alternative projects situated directly in the Mediaspree area: Yaam, Bar25, Maria and the others which are going to close to make way for towers and office blocks. I hope Mediaspree is the last really big mistake in Berlin, because the politicians should recognize that they've been going too far by allowing nearly everyone to buy out the right and left side of the Spree. They’ve got rid of an area which is so valuable in so many different ways, like recreation, alternative culture, the feeling that Berlin is not just a big city but also a very lively space for many different cultures and peoples and attitudes. So what they are doing is monostructuring all the Spree with office buildings and this kind of stuff, and pushing alternative projects, which have been there for ten years, out of the area. This is what we mean by gentrification: people who with creative energy and power get into a space, create something interesting, and are then thrown out on account of money, because they’ve been making the space interesting. This kind of thing is affecting RAW.tempel, because what's actually happening is that the whole area – we're talking about an area larger than 80 football fields – has been bought by a company whose only interest is making money out of land speculation. They don't want to develop anything, they don't want to create city spaces, do something where you can discuss if it's good or bad, they just want to push the price of the land up and get money out of the fact that they own it. So in this case they bought the site for 4 million euros two years ago and they might sell it for between 11 and 20 million next year. So they triple or quadruple the money they invested. Of course 4 million is not a price which reflects real monetary value, it reflects a lot of circumstances and aspects which you have to keep in mind: you have to spend a lot of money just to get rid of great parts of the rotten old structures, get rid of the chemicals in the ground, build an infrastructure so that you are able to develop something. So you will have a lot of cost just to get the thing in shape. The investors want us to be a project who they can throw out at any time, where they dictate the framework of what we can do and how we have to do it. We were the first who developed anything on this empty space, attracting people to come and see what they can do with it, so there's no way that anyone is going to tell us what we can do there and what not. So we're arguing this, and we're also arguing that the whole area should not be developed just for maximum profit, but instead they should keep in mind the needs of the people who live in the area around, who don't have any playgrounds, or any green, open space just to be in. Because we say this, and we mean what we say, we’re not just trying to get a better position in negotiations, it's difficult for the investors to deal with us. And this is why they'd like us to go. But I don't think they will manage this. There's a strong political will to keep RAW.tempel, because with the public voting about Mediaspree, political parties and responsible authorities have realized that people really don’t like things going on like this without anyone having a brake in their hand. So I don't think politicians will make the same mistakes in the RAW area as they did with Mediaspree, but of course it will not be heaven on earth. An investor wants to earn money, and he wants to develop the thing, so there have to be compromises in some or many fields. But that does also mean that there has to be space for alternative cultures, recreation space for the neighbourhood, away from the cars, the pollution and all the velocity of the city."